What Watch? This watch! Pun. The Calendar from What? 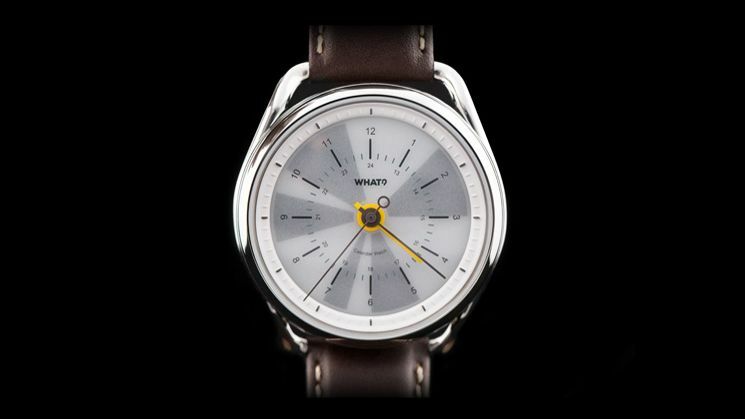 Watch is a really innovate take on a connected analogue watch. We've seen fitness trackers and smartphone notifications before, but the Calendar Watch aims to keep your life organised and uncluttered. The stylish wearable connects to your smartphone, and uses the digital calendar to display your day's schedule on the watch face. There are no separate dials or complications, instead, you schedule is converted into a radial pie-chart, and then project on the monotone e-paper display. Of course, there's also a companion app, which allows you to sync the time automatically to the time zone, select what calendars you wish to sync, and view battery life. Battery life is around three weeks, and it's rechargeable. The Calendar Watch has passed it's funding goal on Kickstarter, but you can still back it and get the watch for a SUPER EARLY BIRD price of €160 (around £125).